While Limestone Branch continues to distill and age its own whiskies (and while it expands), its partnership with Luxco has given Steve and Paul Beam access to additional sourced whiskey – this time Straight Rye Whiskey from Indiana. Just as Limestone Branch was transparent with its previous releases of sourced Bourbon while resurrecting the family heritage of Yellowstone, Minor Case honors their family heritage and their grandfather Minor Case Beam with similar transparency. Coincidentally, Luxco has also just released a two-year Rye, so the starting point of these two whiskies could be the same, although MGP has different Rye mash bills. One clear difference is in the finishing at Limestone Branch. Additionally, an aesthetic difference is in the packaging; the bottle for Minor Case Rye is absolutely beautiful. In fact, I can’t think of another whiskey bottle that makes such an impression. 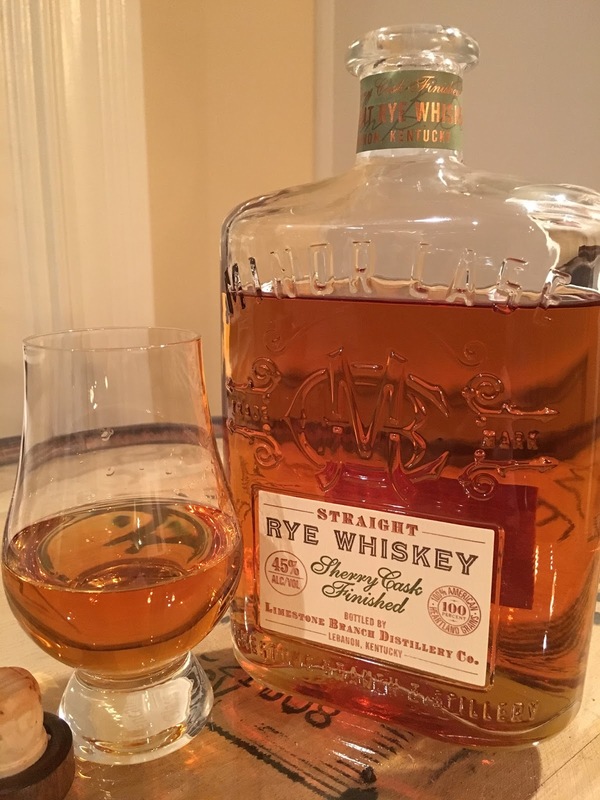 I was interested to see whether a two-year Rye could be as impressive as its appearance. Finished and bottled by Limestone Branch Distillery, Lebanon, Ky.
Light amber, but darker than typical two-year old whiskey, presumably a more subtle contribution of sherry cask finishing. Great fruity nose with berries and light fruit like pear, and an enticing balance of rye spice. There is not much oak influence, but that is to be expected. Lack of oak, however, does not mean that has aromas like many young whiskies. Perhaps again because of the sherry influence, this does not smell like a young whiskey. Like the nose—and just as expected given the age—this is not an oaky Rye, but frankly it doesn’t need oak. Flavors of peaches, apricot, brown sugar, coffee cake with icing, and a hint of raisin make this a predominantly sweet Rye. The rye spice is warming, which tells me that this is not MGP’s 95% rye mash bill; it drinks more like a really high-rye Bourbon, but that also might be the sherry cask influence. This whiskey feels older because of its warming and coating sensations, without the telltale signs of being a relatively young whiskey. I would never have guessed the age. Crisp to medium finish, with a swell of cinnamon, dried fruit sweetness, and cocoa. Sherry casks have been a huge part of Scotch Whisky, but not so much with Bourbon or Rye Whiskey. My only other point for comparison is the Canadian Rye Alberta Premium Dark Horse, which actually blends in a little bit of Oloroso Sherry. That one was a little too unbalanced for my liking, but Limestone Branch found a fantastic balance, which I hope can be duplicated in future batches. I’ll be interested to see whether Limestone Branch tries the same finishing approach if Luxco can get access to older stocks from MGP. Can you imagine a Rye NCF barrel-strength equivalent of Aberlour a’bunadh? In the meantime, Minor Case Sherry-Finished Rye is a winner. It’s so good that I wonder why sherry cask finishing hasn’t been more popular with American Rye producers. Thanks for reading and I hope that you're able to find a bottle of this one! Just to give you a heads up, J. Rieger's Kansas City Whiskey also blends in Oloroso Sherry into their juice. You should give it a go if you haven't had it yet. Thanks for this tip. I just looked up J. Rieger's and see that it is “a blend of Straight Bourbon Whiskey, Light Corn Whiskey, and Straight Rye Whiskey, all aged at least 4 years, as well as a small amount of 15 year old Oloroso Sherry from the Williams & Humbert Bodega in Jerez.” Alberta Premium Dark Horse, which also blends in Sherry, was a little too much for me, but I might be interested in checking out J. Rieger's.